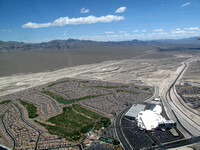 Las Vegas, the fastest growing metropolitan areas in the United States, exemplifies the problems of rampant urban sprawl. As the gaming and tourism industry continue to blossom, so has the population. In 1950 the population was just under 25,000. When tourists and year-round residents are taken into account together, the population tops one million today. Modern urbanization creates profound changes to the landscape, specifically the proliferation of asphalt and concrete along with the displacement of agriculture and forestland. Major concerns associated with this growth include strain on water supplies, diminished air quality, and the threat posed by continued growth in earth fissures. After its incorporation in 1911, the city of Las Vegas was just a stop along the railroad for the first part of the century. The first growth spurt occurred in the 1930s with the construction of the Hoover Dam on the nearby Colorado River and the legalization of gambling. The first hotels went up in the 1940s, both downtown and on what became known as the Strip. As the gaming industry blossomed, Las Vegas was put on the map. In the 60s and 70s growth continued, fueled by tourism and the nationwide migration towards the sunbelt. Today, one can see the impact of urban sprawl in Las Vegas, characterized by its casinos, amusement attractions, and the enormous hotels that double as entertainment parks.